(CHARLESTOWN,NEVIS–FRIDAY, APRIL 1ST 2011) Premier of Nevis, the Hon. Joseph Parry welcomed the World Class Triathlon to Nevis and said the event would be a boost to the island’s Sports Tourism sector. He made the statement on the popular radio show, In Touch with the Premier on Tuesday. Triathlon organizers, Mr. Greg Phillip and Mr. Winston Crooke were congratulated by the Premier for pursuing biking and bringing the world event to Nevis. “Let us give the credit to the gentlemen for putting Nevis on the map in Sports Tourism,” said the Premier. Meantime, the Hon. 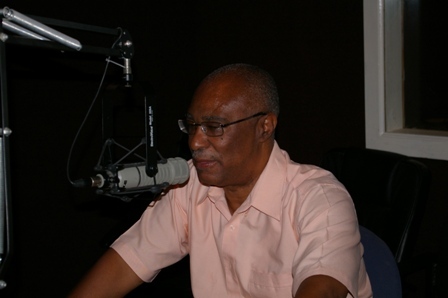 Joseph Parry asked motorists to drive carefully and give way to the athletes and stressed the importance of the world class event to Nevis. “This event is very important to the island and the impact of this event to tourism this week has been fantastic,” remarked the Premier. During the program, Premier Parry also congratulated Nevisian swimmer Mr. Jervan Swanston who swam from Nevis to St. Kitts. According to the Premier, the hotel sector on Nevis also did well as a number of hotels were doing well namely Oualie Beach Hotel, Carino, Pinney’s Beach, Nisbetts Beach Club and the Mount Nevis Hotel who were all experiencing at least 50 percent occupancy or better because of the Triathlon. “As the athletes take in the weather, the good roads and good experiences on Nevis, we hope they would return to Nevis soon,” said the Premier. Mr. Parry also mentioned that the St. James Drag Raceway is also an addition to the Sports Tourism market. He said that the St. James drag strip had great potential and could attract drivers and their fans from Anguilla, Antigua, St. Maarten, Puerto Rico, St. Lucia and Trinidad. He also said that the races could be recorded on ESPN and thereby increase the number of car rentals and hotel stays on the island. “We had over 5,000 people on the first day of the event ticket sales were outstanding with $78,000 within the day. The restaurants and huskers did well and the Sea Bridge transport also did very well on that day,” said the Premier. The Premier also discussed how the Opposition party on Nevis, the Concerned Citizens Movement (CCM) had distracted and misinformed the people of Nevis when they said there had not been any good use of the drag strip. “The Nevis Reformation Party (NRP) Government is transparent and has revealed good governance and we the NRP led Government saved Nevis in 2006 and that is why the island is doing extremely well today,” said the Premier.